You won’t be hearing Hank Williams,Jr., ask “Are you ready for some football?” any longer on ESPN’s “Monday Night Football” broadcast. After likening a golf outing by President Obama and John Boehner to a meeting between Hitler and Prime Minister Benjamin Netanyahu, and referring to President Obama and Vice President Biden as “the enemy,” Williams was yanked from the broadcast on Monday. We have decided to part ways with Hank Williams, Jr. We appreciate his contributions over the past years. The success of Monday Night Football has always been about the games and that will continue. After reading hundreds of e-mails, I have made MY decision,” he wrote. “By pulling my opening Oct 3rd, You (ESPN) stepped on the Toes of The First Amendment Freedom of Speech, so therefore Me, My Song, and All My Rowdy Friends are OUT OF HERE. It’s been a great run. Truth being told, it will be refreshing to hear a new theme song. Will ESPN find one new performer or will they mix it up and give us a variety throughout the season? It might even make sense for them to commission a song that they own the rights to. This coming Monday will be quite interesting. I say they should call my fellow Chicagoan J. Ivy (who can be seen on the Sunday Night Football intro) and let him handle it. 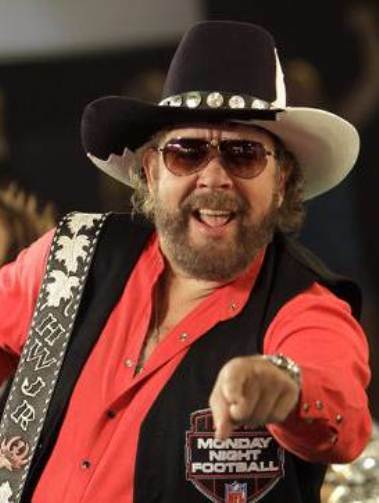 Who would you like to hear/see replace Hank Williams, Jr.?